Please refer to our stock # tr1 when inquiring. This beautiful vintage cocktail ring is handcrafted from filigree sterling silver giving this shank a bold yet airy look. 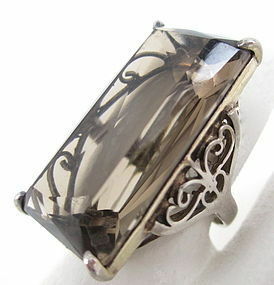 The center faceted smoky topaz is 14 x 30mm and the shank is a size 6 1/2" with plenty of room for adjustment if needed. It is in excellent condition and is hallmarked 925 on the inner shank.